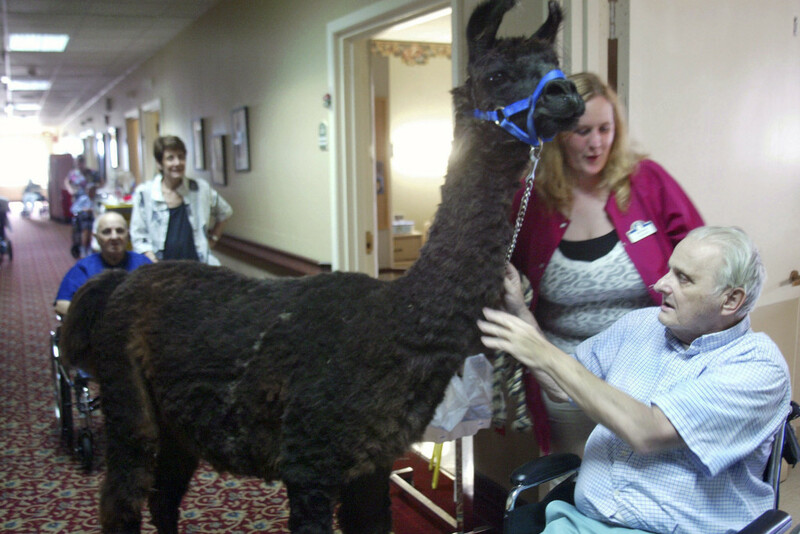 The facility uses llamas, alpacas, goats and chickens to brighten patients' lives. LITTLETON, Mass. — At the Life Care Center of Nashoba Valley, it’s not uncommon to see patients asleep in their wheelchairs by the saltwater-fish tank or out for a stroll around a pasture filled with grazing animals like goats and llamas. Director Ellen Levinson said while the merits of “pet therapy” have been adopted and used at various skilled nursing facilities across the country, it’s rare to find chickens and alpacas at a site. Nicole Burak shows Travis to Bill Machlemer at Life Care Center. The 120-bed center has a policy to resort rarely to medications for unruly residents. At the 120-bed nursing home, which houses a specialized memory-support unit for those with severe dementia and other conditions that affect the memory, staff members make time to ensure their patients interact with the animals whenever possible. 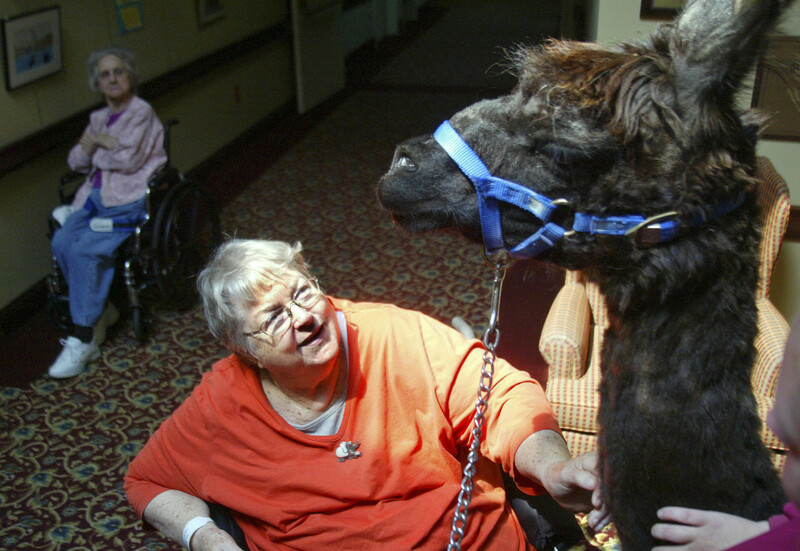 Levinson developed animal therapy and even “llama psychology” further at her facility to bring brightness to patients’ days. Levinson, an animal lover, launched the program, which now has fish, an alpaca, dogs and goats, but it initially started out with just her own pet golden retrievers. She now has staff once in a while walk one good-natured llama named Travis through the building for a treat. The local Life Care Center, run through the national group Life Care Centers of America, with 200 facilities across the country, has a policy to resort rarely to medications for unruly residents. Levinson said she can’t attribute all of her staff’s success to the presence of animals, but she says they help. This spring, the Life Care Center of Nashoba Valley was awarded a perfect score by the state Department of Public Health in a survey of nursing homes and senior-care providers. Levinson said the animals help make the facility more enjoyable and help visiting family members feel more at ease, giving them a chance to talk about something other than sickness and health in a medical setting. Program Director Erica Labb, who oversees the floor, said residents of all ages come into the Life Care Center with family members who haven’t prepared for this stage. Levinson said that’s why she encourages family members visiting, and even her staff to get better prepared for the end while they’re here. According to Kaiser Health News, in 2011, Medicare spending reached close to $554 billion, which amounted to 21 percent of the total spent on U.S. health care in that year. Of that $554 billion, Medicare spent 28 percent, or about $170 billion, on patients’ last six months of life. Levinson said some people as young as 55 develop dementia or other memory-based diseases like Alzheimer’s, and it’s never too early to prepare for that stage. She said almost half the time, she finds patients who don’t have a health care proxy designated or a listing of what they want at the end of life. At the Life Care Center, though, Levinson said her facility adopts a pro-animal policy to make a stay in Littleton as pleasant as possible. In the memory-support room, next to a hand-painted mural on the wall of an underwater ocean scene, about 30 people recently sat quietly. Some knitted. Others stared out the window, toward a chicken coop – the latest addition to the facility’s animal kingdom. “The idea for the chickens is that people who have mild, midstage dementia to late-stage, are too agitated and distracted to sit still and do a craft project or a word game or listen to a music program,” Levinson said.